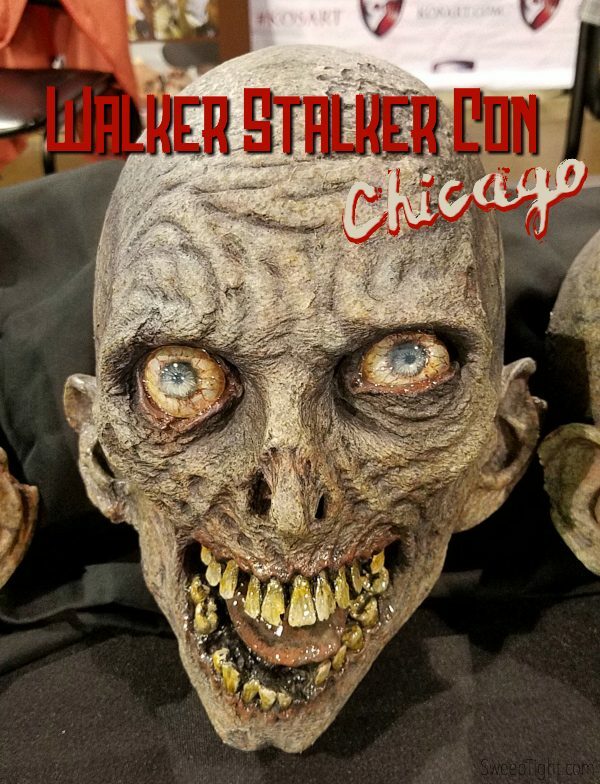 This year’s Walker Stalker Con in Chicago was a freaking blast. I attended with a few blogger buddies and we had quite the adventure. From being thrown into The Walking Dead Experience to chatting with some of the coolest celebrities, Walker Stalker Con is definitely one of my favorite cons of the year. We received media passes to facilitate our posts. All thoughts and opinions are based entirely on our experiences. This is the only place I know of where you can be attacked by zombies–and become one yourself, meet your favorite celebrities, see awesome cosplay, and shop for some of the coolest horror stuff I’ve ever seen. The atmosphere is totally exciting. Everyone is thrilled to be there and totally into the act. If you really want to get a feel for what it’s like to be on The Walking Dead, check out Meredith’s post about The Walking Dead Experience. It was so much fun! 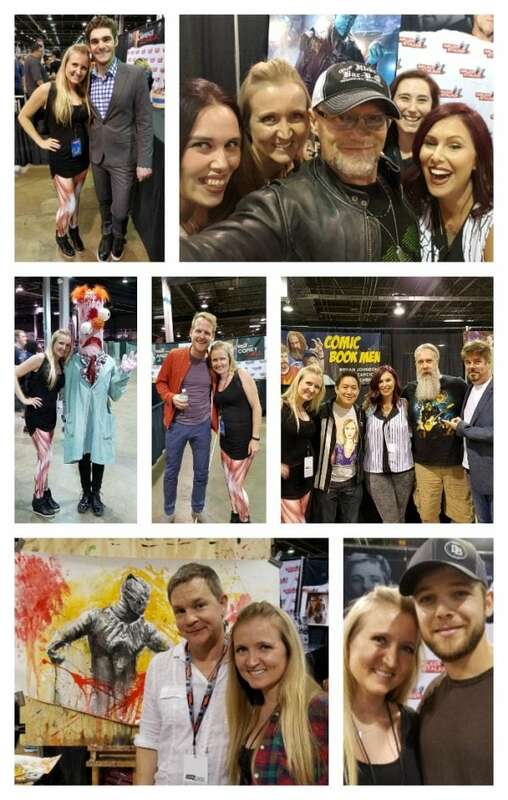 The majority of the cast from The Walking Dead were there to chat and take pictures with fans. Max Thieriot (Bates Motel), RJ Mitte (Breaking Bad), The Comic Book Men, and many more were also there. (Photos do cost a bit so plan ahead who you want your selfie or more professional shot with and bring cash.) The Backstreet Boys were there promoting their new film, Dead 7. Even the original stars of Night of the Living Dead were there! Judith O’Dea is a doll. We literally got caught in the splash zone watching the incredible, Rob Prior do his thing with paint and music. I’m legit honored to say that a drop of red paint has permanently stained the bottom of my linen skirt. We spent quite a bit of time chatting with Corey Brill (Pete, The Walking Dead). Having played such rotten characters, it was a bit of a shock to discover that he’s a really nice guy. We, of course, asked what it was like to have that fight scene with Andrew Lincoln (Rick, The Walking Dead). He said it was super intense. He actually got fake blood in his eye and the stunt crew kinda freaked out thinking he was injured. The fake blood actually stained his contact lenses! He even had them with him and showed us! For more about our hilarious celebrity encounters, check out Christa’s post! I’ve attended quite a few cons now and I must say, Walker Stalker Con does not disappoint when it comes to the fans and their cosplay. I love seeing how people express their love for their favorite characters. The creativity is truly endless. Perhaps the best cosplayer of all time… Meet #Pintsizeddaryl. Is he not the cutest little thing?! His name is Aiden and he’s seven. 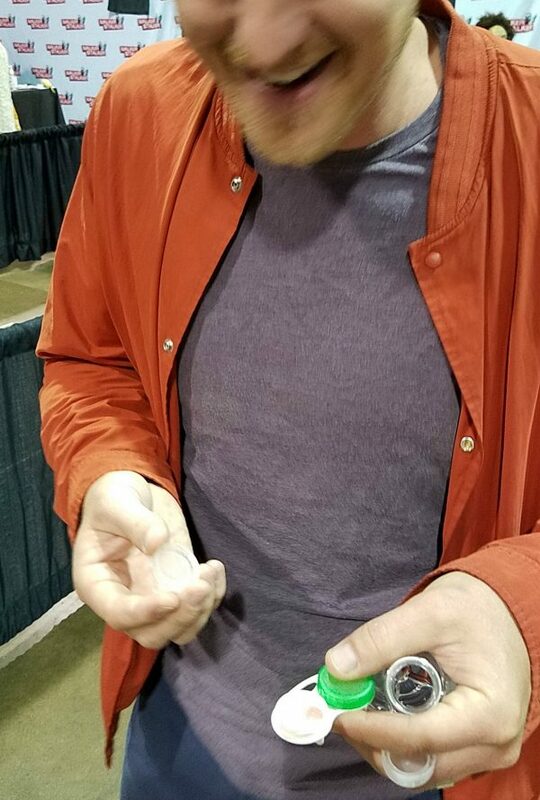 He never let his stone-cold Daryl face drop and he even signed autographs for all of us. I even bust out my muscle leggings! It’s not often there is an ‘appropriate’ time to wear these so I get super excited when I finally get the chance. There’s me with Meredith below. 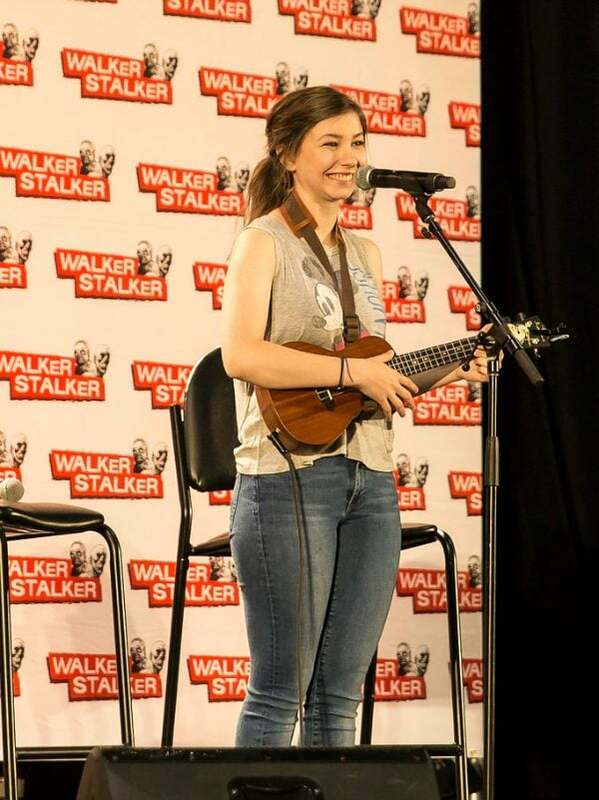 The adorable Katelyn Nacon (Enid, The Walking Dead) treated us with a couple cover songs and even an original song she wrote herself. She’s only 16 and WOW! I had no idea she had such a fantastic voice. She’s absolutely adorable. One of my favorite parts about Walker Stalker Con was that there wasn’t an over abundance of vendors. There were only high quality shopping booths and it wasn’t overwhelming at all. In fact, it was super fun walking around looking at all the authentic, original pieces of art. Um, I almost died when I saw the Graboid. 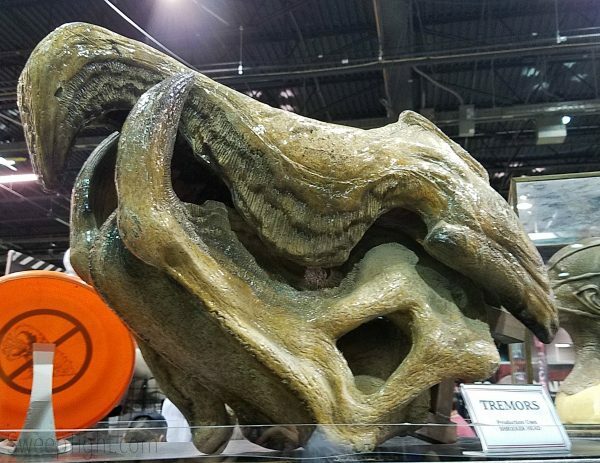 Tremors was one of my most-watched movies as a kid. Think you know everything about the Walking Dead? Guess again. With over 500 Questions, this is the ultimate fan trivia game for any Walking Dead enthusiast. For 2-4 players ages 12 and up. I even stumbled upon a booth with an artist, Cory Smith, that resembled my own father so closely I made a bit of a fool out of myself. But seriously, this man must be related somehow. The similarity is uncanny–as is his talent. He creates the most realistic drawings of all our favorite comic characters with just a pencil. Follow him on Instagram to see for yourself. 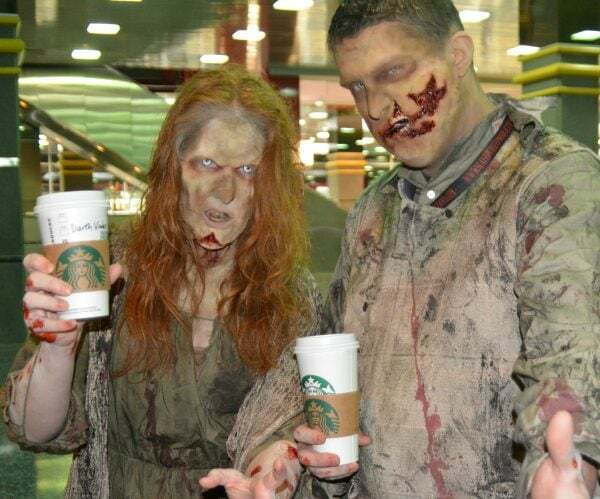 Will you attend Walker Stalker Con near you? My nephew would have loved to have attended this, he loves this stuff. Great pics, thanks for sharing. 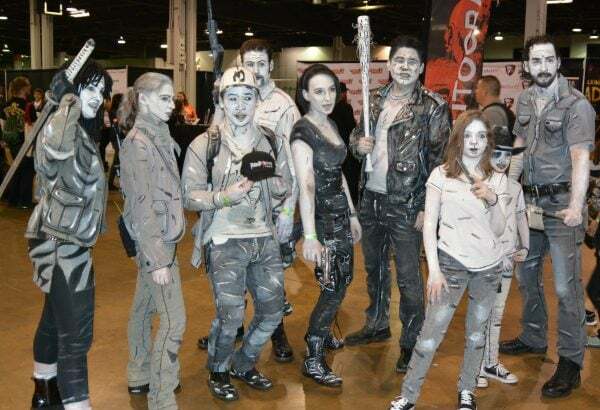 My kids and I would have had a blast at this Walker Stalker Con! I love the photos and anything to do with the Walking Dead has got to be fun! We will be going to a Comic Con on Long Island soon! I’m glad you had a great time. Love those muscle tights. Nothing I’d go see.